2019 Bajaj Dominar 400 will be the first Bajaj motorcycle to get USD (Upside Down) forks. There would not be many to argue the fact that Bajaj Dominar is a better overall motorcycle in the segment, than any other on offer in India today. And that too at a price which no one can beat. But in spite of all this, the success of this motorcycle cannot be seen in terms of sales – which are dwindling in the 700 to 1,100 region. This is hardly a fraction of what Bajaj had hoped at the time of launch (hopes were to sell 10k units a month). Bajaj has tried multiple marketing ideas to boost sales. From calling its rival a haathi, which is not only outdated, but also unreliable to showing Dominar as the best value for money two wheeler out there – they have tried it all. Though this has generated a lot of buzz on social media, it has not helped them to get desired sales. With marketing ideas failing, it is their engineering dept that seems to have come to the rescue. 2019 Bajaj Dominar is currently on test, and will launch soon. 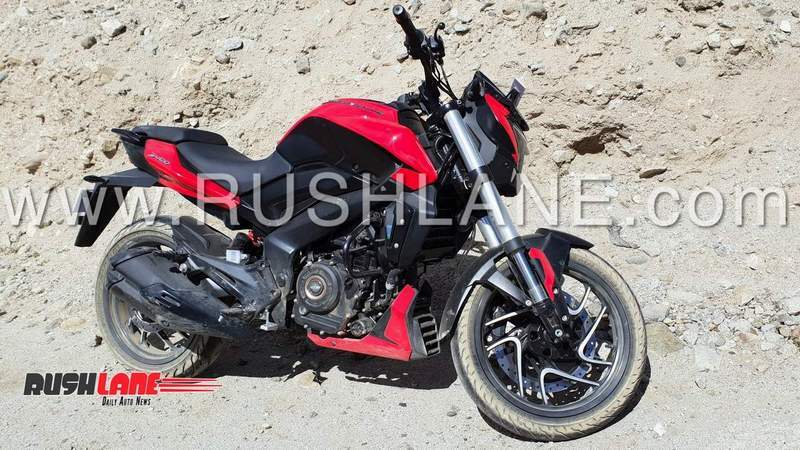 2019 Bajaj Dominar 400 has been spied multiple times on test with launch date set for Q1 2019. In terms of updates, the 2019 Bajaj Dominar 400 will see design as well as mechanical updates. The two striking updates on offer are the USD forks in the front, and a larger exhaust system. Below is the exhaust note video, which gives a good idea as to how different the exhaust sounds in comparison to the current Bajaj Dominar exhaust. It will also receives a larger radiator, revised rear view mirrors. It will continue to sport full LED headlamps, a fully digital instrument cluster and dual disc brakes along with ABS and slipper clutch offered as standard. It will also continue to sit on 17” alloy wheels fitted with tubeless tyres. 2019 Bajaj Dominar will be powered by the same 373cc, liquid cooled, single cylinder engine as seen on its current counterpart. As on date, the engine offers 34.5 bhp power and 35 Nm torque. These power and torque figures could see a boost on the new Dominar 400; thereby leading to better performance.